This T-shirt was produced by the Barnet Anti-Apartheid Group in 1981. 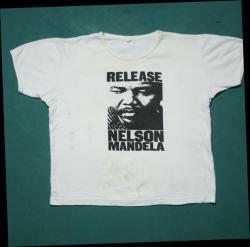 The T-shirt is mentioned in the January-February 1981 issue of the newsletter Anti-Apartheid News. The Barnet Anti-Apaprtheid Group was a local group in north London affiliated to the Anti-Apartheid Movement. They pioneered the production of T-shirts publicizing Anti-Apartheid Movement campaigns. 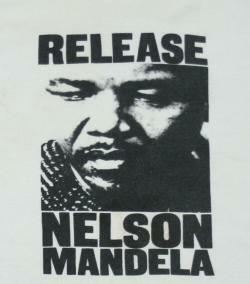 They also produced T-shirts and sweat shirts in a range of colors with the Anti-Apartheid Movement logo. Used by permission of the Anti-Apartheid Movement Archives Committee.